$895 deposit. 47 monthly repayments of $415. 60,000 KM allowance and a final payment of $10183 to keep your Toyota. $895 deposit. 47 monthly repayments of $438. 60,000 KM allowance and a final payment of $10183 to keep your Toyota. $896 deposit. 47 monthly repayments of $461. 60,000 KM allowance and a final payment of $10183 to keep your Toyota. $896 deposit. 47 monthly repayments of $446. 60,000 KM allowance and a final payment of $10944 to keep your Toyota. $895 deposit. 47 monthly repayments of $442. 60,000 KM allowance and a final payment of $10183 to keep your Toyota. $895 deposit. 47 monthly repayments of $427. 60,000 KM allowance and a final payment of $10944 to keep your Toyota. $896 deposit. 47 monthly repayments of $456. 60,000 KM allowance and a final payment of $10183 to keep your Toyota. $896 deposit. 47 monthly repayments of $467. 60,000 KM allowance and a final payment of $10183 to keep your Toyota. $896 deposit. 47 monthly repayments of $472. 60,000 KM allowance and a final payment of $9929 to keep your Toyota. $1500 deposit. 47 monthly repayments of $506. 60,000 KM allowance and a final payment of $11878 to keep your Toyota. $1500 deposit. 47 monthly repayments of $532. 60,000 KM allowance and a final payment of $11878 to keep your Toyota. $1038 deposit. 47 monthly repayments of $467. 60,000 KM allowance and a final payment of $11878 to keep your Toyota. [^A]Comparison Rates will vary for each customer between 6.37% and up to 16.42% (and annual percentage rates between 4.06% to 13.92%) depending primarily on your credit score and other relevant criteria determined by Toyota Finance. Comparison rates of 9.19% are available to around 70% of potential customers with a credit score of 600 and above, who also satisfy other relevant criteria determined by Toyota Finance. These figures are based on modelling by Toyota Finance. 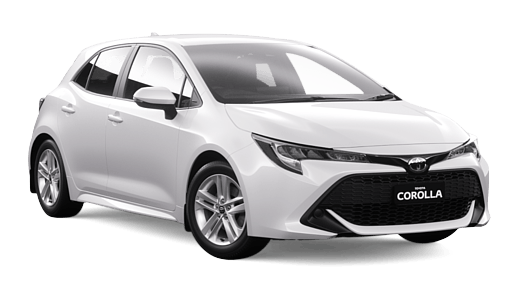 [†A] $117 per week are available on a Toyota Access Consumer Loan to approved personal applicants of Toyota Finance to finance the purchase of a Toyota Corolla Ascent Sport Hatch Hybrid (Crystal Pearl and Black Fabric) Automatic, 1.8L Hybrid . Driveaway price of $29780 (includes 12 months registration, 12 months compulsory third party insurance, dealer delivery and stamp duty), less a deposit of $1500, with 47 monthly payments in arrears not exceeding $506 and a balloon final payment (equal to the ‘GFV’) of $11878. Additional interest charges accrue whenever a balloon final payment option is selected. Based on an annual percentage rate of 6.83 %. Total amount payable $35661. Terms, conditions, fees and charges apply. Offer valid until 25/04/2019. Comparison Rate of 9.19% is based on a 5 year secured consumer fixed rate loan of $30,000. WARNING: This comparison rate is true only for the examples given and may not include all fees and charges. Different terms, fees or other loan amounts might result in a different comparison rate. Toyota Finance is a division of Toyota Finance Australia Limited ABN 48 002 435 181, AFSL and Australian Credit Licence 392536. The Guaranteed Future Value ('GFV') is the minimum value of your new or approved demonstrator Toyota at the end of your finance contract, as determined by Toyota Finance, subject to fair wear and tear conditions and agreed kilometres being met (up to 60000 km). Please speak with your dealer for more information. [^B]Comparison Rates will vary for each customer between 6.37% and up to 16.42% (and annual percentage rates between 4.06% to 13.92%) depending primarily on your credit score and other relevant criteria determined by Toyota Finance. Comparison rates of 9.19% are available to around 70% of potential customers with a credit score of 600 and above, who also satisfy other relevant criteria determined by Toyota Finance. These figures are based on modelling by Toyota Finance. 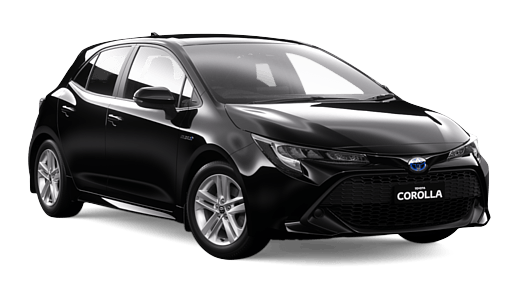 [†B] $117 per week are available on a Toyota Access Consumer Loan to approved personal applicants of Toyota Finance to finance the purchase of a Toyota Corolla Ascent Sport Hatch Hybrid with Tyre repair kit (Crystal Pearl and Black Fabric) Automatic, 1.8L Hybrid . Driveaway price of $29780 (includes 12 months registration, 12 months compulsory third party insurance, dealer delivery and stamp duty), less a deposit of $1500, with 47 monthly payments in arrears not exceeding $506 and a balloon final payment (equal to the ‘GFV’) of $11878. Additional interest charges accrue whenever a balloon final payment option is selected. Based on an annual percentage rate of 6.83 %. Total amount payable $35661. Terms, conditions, fees and charges apply. Offer valid until 25/04/2019. Comparison Rate of 9.19% is based on a 5 year secured consumer fixed rate loan of $30,000. WARNING: This comparison rate is true only for the examples given and may not include all fees and charges. Different terms, fees or other loan amounts might result in a different comparison rate. Toyota Finance is a division of Toyota Finance Australia Limited ABN 48 002 435 181, AFSL and Australian Credit Licence 392536. The Guaranteed Future Value ('GFV') is the minimum value of your new or approved demonstrator Toyota at the end of your finance contract, as determined by Toyota Finance, subject to fair wear and tear conditions and agreed kilometres being met (up to 60000 km). Please speak with your dealer for more information. [^C]Comparison Rates will vary for each customer between 6.37% and up to 16.42% (and annual percentage rates between 4.06% to 13.92%) depending primarily on your credit score and other relevant criteria determined by Toyota Finance. Comparison rates of 9.19% are available to around 70% of potential customers with a credit score of 600 and above, who also satisfy other relevant criteria determined by Toyota Finance. These figures are based on modelling by Toyota Finance. [†C] $117 per week are available on a Toyota Access Consumer Loan to approved personal applicants of Toyota Finance to finance the purchase of a Toyota Corolla Ascent Sport Hatch Hybrid (Eclectic Blue and Black Fabric) Automatic, 1.8L Hybrid . Driveaway price of $29780 (includes 12 months registration, 12 months compulsory third party insurance, dealer delivery and stamp duty), less a deposit of $1500, with 47 monthly payments in arrears not exceeding $506 and a balloon final payment (equal to the ‘GFV’) of $11878. Additional interest charges accrue whenever a balloon final payment option is selected. Based on an annual percentage rate of 6.83 %. Total amount payable $35661. Terms, conditions, fees and charges apply. Offer valid until 25/04/2019. Comparison Rate of 9.19% is based on a 5 year secured consumer fixed rate loan of $30,000. WARNING: This comparison rate is true only for the examples given and may not include all fees and charges. Different terms, fees or other loan amounts might result in a different comparison rate. Toyota Finance is a division of Toyota Finance Australia Limited ABN 48 002 435 181, AFSL and Australian Credit Licence 392536. The Guaranteed Future Value ('GFV') is the minimum value of your new or approved demonstrator Toyota at the end of your finance contract, as determined by Toyota Finance, subject to fair wear and tear conditions and agreed kilometres being met (up to 60000 km). Please speak with your dealer for more information. [†D] $103 per week is available on a Toyota Access Consumer Loan to approved personal applicants of Toyota Finance to finance the purchase of a Toyota Corolla Ascent Sport Hatch Automatic CVT (Silver Pearl and Black Fabric) Automatic, 2.0L Petrol as you have selected above. Offer excludes business, government, fleet and rental buyers. Driveaway price of $28186 (includes 12 months registration, 12 months compulsory third party insurance, dealer delivery and stamp duty), less a deposit of $895 with 47 monthly payments in arrears not exceeding $442 and a balloon final payment (equal to the GFV) of $10183. Additional interest charges accrue whenever a balloon final payment option is selected. Based on an annual percentage rate of 3.88 %. Terms, conditions, fees and charges apply. Offer valid until 30/04/2019. Toyota Finance reserves the right to change, extend or withdraw an offer at any time. Comparison Rate of 4.90% is based on a 5 year secured consumer fixed rate loan of $30,000.WARNING: This comparison rate is true only for the examples given and may not include all fees and charges. Different terms, fees or other loan amounts might result in a different comparison rate. Toyota Finance is a division of Toyota Finance Australia Limited ABN 48 002 435 181, AFSL and Australian Credit Licence 392536. The Guaranteed Future Value (GFV) is the minimum value of your new or approved demonstrator Toyota at the end of your finance contract, as determined by Toyota Finance, subject to fair wear and tear conditions and agreed kilometres being met. The GFV is current as at 25/04/2019. Please speak with your Dealer for more information. [†E] $103 per week is available on a Toyota Access Consumer Loan to approved personal applicants of Toyota Finance to finance the purchase of a Toyota Corolla Ascent Sport Hatch Hybrid (Silver Pearl and Black Fabric) Automatic, 1.8L Hybrid as you have selected above. Offer excludes business, government, fleet and rental buyers. Driveaway price of $29780 (includes 12 months registration, 12 months compulsory third party insurance, dealer delivery and stamp duty), less a deposit of $1011 with 47 monthly payments in arrears not exceeding $443 and a balloon final payment (equal to the GFV) of $11878. Additional interest charges accrue whenever a balloon final payment option is selected. Based on an annual percentage rate of 3.88 %. Terms, conditions, fees and charges apply. Offer valid until 30/04/2019. Toyota Finance reserves the right to change, extend or withdraw an offer at any time. Comparison Rate of 4.90% is based on a 5 year secured consumer fixed rate loan of $30,000.WARNING: This comparison rate is true only for the examples given and may not include all fees and charges. Different terms, fees or other loan amounts might result in a different comparison rate. Toyota Finance is a division of Toyota Finance Australia Limited ABN 48 002 435 181, AFSL and Australian Credit Licence 392536. The Guaranteed Future Value (GFV) is the minimum value of your new or approved demonstrator Toyota at the end of your finance contract, as determined by Toyota Finance, subject to fair wear and tear conditions and agreed kilometres being met. The GFV is current as at 25/04/2019. Please speak with your Dealer for more information. [^F]Comparison Rates will vary for each customer between 6.37% and up to 16.42% (and annual percentage rates between 4.06% to 13.92%) depending primarily on your credit score and other relevant criteria determined by Toyota Finance. Comparison rates of 9.19% are available to around 70% of potential customers with a credit score of 600 and above, who also satisfy other relevant criteria determined by Toyota Finance. These figures are based on modelling by Toyota Finance. 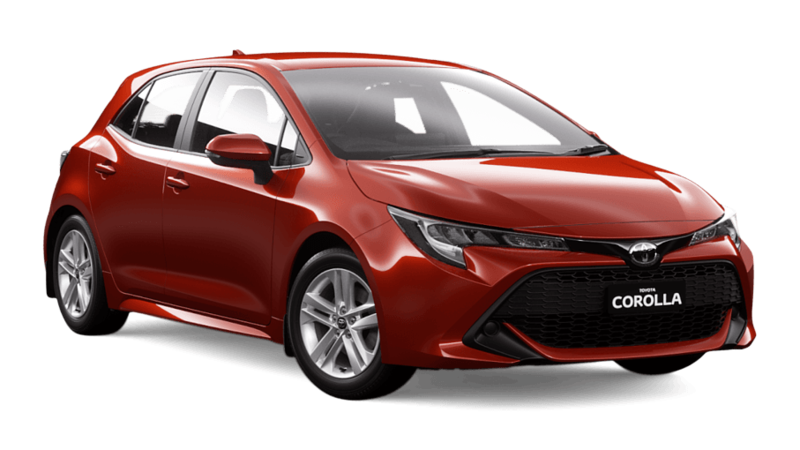 [†F] $123 per week are available on a Toyota Access Consumer Loan to approved personal applicants of Toyota Finance to finance the purchase of a Toyota Corolla Ascent Sport Hatch Hybrid with Satellite Navigation (Volcanic Red and Black Fabric) Automatic, 1.8L Hybrid . Driveaway price of $30850 (includes 12 months registration, 12 months compulsory third party insurance, dealer delivery and stamp duty), less a deposit of $1500, with 47 monthly payments in arrears not exceeding $532 and a balloon final payment (equal to the ‘GFV’) of $11878. Additional interest charges accrue whenever a balloon final payment option is selected. Based on an annual percentage rate of 6.83 %. Total amount payable $36883. Terms, conditions, fees and charges apply. Offer valid until 25/04/2019. Comparison Rate of 9.19% is based on a 5 year secured consumer fixed rate loan of $30,000. WARNING: This comparison rate is true only for the examples given and may not include all fees and charges. Different terms, fees or other loan amounts might result in a different comparison rate. Toyota Finance is a division of Toyota Finance Australia Limited ABN 48 002 435 181, AFSL and Australian Credit Licence 392536. The Guaranteed Future Value ('GFV') is the minimum value of your new or approved demonstrator Toyota at the end of your finance contract, as determined by Toyota Finance, subject to fair wear and tear conditions and agreed kilometres being met (up to 60000 km). Please speak with your dealer for more information. [†G] $108 per week is available on a Toyota Access Consumer Loan to approved personal applicants of Toyota Finance to finance the purchase of a Toyota Corolla Ascent Sport Hatch Hybrid with Satellite Navigation (Crystal Pearl and Black Fabric) Automatic, 1.8L Hybrid as you have selected above. Offer excludes business, government, fleet and rental buyers. Driveaway price of $30850 (includes 12 months registration, 12 months compulsory third party insurance, dealer delivery and stamp duty), less a deposit of $1038 with 47 monthly payments in arrears not exceeding $467 and a balloon final payment (equal to the GFV) of $11878. Additional interest charges accrue whenever a balloon final payment option is selected. Based on an annual percentage rate of 3.88 %. Terms, conditions, fees and charges apply. Offer valid until 30/04/2019. Toyota Finance reserves the right to change, extend or withdraw an offer at any time. Comparison Rate of 4.90% is based on a 5 year secured consumer fixed rate loan of $30,000.WARNING: This comparison rate is true only for the examples given and may not include all fees and charges. Different terms, fees or other loan amounts might result in a different comparison rate. Toyota Finance is a division of Toyota Finance Australia Limited ABN 48 002 435 181, AFSL and Australian Credit Licence 392536. The Guaranteed Future Value (GFV) is the minimum value of your new or approved demonstrator Toyota at the end of your finance contract, as determined by Toyota Finance, subject to fair wear and tear conditions and agreed kilometres being met. The GFV is current as at 25/04/2019. Please speak with your Dealer for more information. [^H]Comparison Rates will vary for each customer between 6.37% and up to 16.42% (and annual percentage rates between 4.06% to 13.92%) depending primarily on your credit score and other relevant criteria determined by Toyota Finance. Comparison rates of 9.19% are available to around 70% of potential customers with a credit score of 600 and above, who also satisfy other relevant criteria determined by Toyota Finance. These figures are based on modelling by Toyota Finance. [†H] $123 per week are available on a Toyota Access Consumer Loan to approved personal applicants of Toyota Finance to finance the purchase of a Toyota Corolla Ascent Sport Hatch Hybrid with Satellite Navigation (Silver Pearl and Black Fabric) Automatic, 1.8L Hybrid . Driveaway price of $30850 (includes 12 months registration, 12 months compulsory third party insurance, dealer delivery and stamp duty), less a deposit of $1500, with 47 monthly payments in arrears not exceeding $532 and a balloon final payment (equal to the ‘GFV’) of $11878. Additional interest charges accrue whenever a balloon final payment option is selected. Based on an annual percentage rate of 6.83 %. Total amount payable $36883. Terms, conditions, fees and charges apply. Offer valid until 25/04/2019. Comparison Rate of 9.19% is based on a 5 year secured consumer fixed rate loan of $30,000. WARNING: This comparison rate is true only for the examples given and may not include all fees and charges. Different terms, fees or other loan amounts might result in a different comparison rate. Toyota Finance is a division of Toyota Finance Australia Limited ABN 48 002 435 181, AFSL and Australian Credit Licence 392536. The Guaranteed Future Value ('GFV') is the minimum value of your new or approved demonstrator Toyota at the end of your finance contract, as determined by Toyota Finance, subject to fair wear and tear conditions and agreed kilometres being met (up to 60000 km). Please speak with your dealer for more information. [†I] $103 per week is available on a Toyota Access Consumer Loan to approved personal applicants of Toyota Finance to finance the purchase of a Toyota Corolla Ascent Sport Hatch Automatic CVT with Satellite Navigation (Eclectic Blue and Black Fabric) Automatic, 2.0L Petrol as you have selected above. Offer excludes business, government, fleet and rental buyers. Driveaway price of $28994 (includes 12 months registration, 12 months compulsory third party insurance, dealer delivery and stamp duty), less a deposit of $896 with 47 monthly payments in arrears not exceeding $446 and a balloon final payment (equal to the GFV) of $10944. Additional interest charges accrue whenever a balloon final payment option is selected. Based on an annual percentage rate of 3.88 %. Terms, conditions, fees and charges apply. Offer valid until 30/04/2019. Toyota Finance reserves the right to change, extend or withdraw an offer at any time. Comparison Rate of 4.90% is based on a 5 year secured consumer fixed rate loan of $30,000.WARNING: This comparison rate is true only for the examples given and may not include all fees and charges. Different terms, fees or other loan amounts might result in a different comparison rate. Toyota Finance is a division of Toyota Finance Australia Limited ABN 48 002 435 181, AFSL and Australian Credit Licence 392536. The Guaranteed Future Value (GFV) is the minimum value of your new or approved demonstrator Toyota at the end of your finance contract, as determined by Toyota Finance, subject to fair wear and tear conditions and agreed kilometres being met. The GFV is current as at 25/04/2019. Please speak with your Dealer for more information. [†J] $108 per week is available on a Toyota Access Consumer Loan to approved personal applicants of Toyota Finance to finance the purchase of a Toyota Corolla Ascent Sport Hatch Automatic CVT with Satellite Navigation (Silver Pearl and Black Fabric) Automatic, 2.0L Petrol as you have selected above. Offer excludes business, government, fleet and rental buyers. Driveaway price of $29244 (includes 12 months registration, 12 months compulsory third party insurance, dealer delivery and stamp duty), less a deposit of $896 with 47 monthly payments in arrears not exceeding $467 and a balloon final payment (equal to the GFV) of $10183. Additional interest charges accrue whenever a balloon final payment option is selected. Based on an annual percentage rate of 3.88 %. Terms, conditions, fees and charges apply. Offer valid until 30/04/2019. Toyota Finance reserves the right to change, extend or withdraw an offer at any time. Comparison Rate of 4.90% is based on a 5 year secured consumer fixed rate loan of $30,000.WARNING: This comparison rate is true only for the examples given and may not include all fees and charges. Different terms, fees or other loan amounts might result in a different comparison rate. Toyota Finance is a division of Toyota Finance Australia Limited ABN 48 002 435 181, AFSL and Australian Credit Licence 392536. The Guaranteed Future Value (GFV) is the minimum value of your new or approved demonstrator Toyota at the end of your finance contract, as determined by Toyota Finance, subject to fair wear and tear conditions and agreed kilometres being met. The GFV is current as at 25/04/2019. Please speak with your Dealer for more information. [†K] $103 per week is available on a Toyota Access Consumer Loan to approved personal applicants of Toyota Finance to finance the purchase of a Toyota Corolla Ascent Sport Hatch Automatic CVT (Crystal Pearl and Black Fabric) Automatic, 2.0L Petrol as you have selected above. Offer excludes business, government, fleet and rental buyers. Driveaway price of $28186 (includes 12 months registration, 12 months compulsory third party insurance, dealer delivery and stamp duty), less a deposit of $895 with 47 monthly payments in arrears not exceeding $442 and a balloon final payment (equal to the GFV) of $10183. Additional interest charges accrue whenever a balloon final payment option is selected. Based on an annual percentage rate of 3.88 %. Terms, conditions, fees and charges apply. Offer valid until 30/04/2019. Toyota Finance reserves the right to change, extend or withdraw an offer at any time. Comparison Rate of 4.90% is based on a 5 year secured consumer fixed rate loan of $30,000.WARNING: This comparison rate is true only for the examples given and may not include all fees and charges. Different terms, fees or other loan amounts might result in a different comparison rate. Toyota Finance is a division of Toyota Finance Australia Limited ABN 48 002 435 181, AFSL and Australian Credit Licence 392536. The Guaranteed Future Value (GFV) is the minimum value of your new or approved demonstrator Toyota at the end of your finance contract, as determined by Toyota Finance, subject to fair wear and tear conditions and agreed kilometres being met. The GFV is current as at 25/04/2019. Please speak with your Dealer for more information. [†L] $99 per week is available on a Toyota Access Consumer Loan to approved personal applicants of Toyota Finance to finance the purchase of a Toyota Corolla Ascent Sport Hatch Automatic CVT (Volcanic Red and Black Fabric) Automatic, 2.0L Petrol as you have selected above. Offer excludes business, government, fleet and rental buyers. Driveaway price of $28186 (includes 12 months registration, 12 months compulsory third party insurance, dealer delivery and stamp duty), less a deposit of $895 with 47 monthly payments in arrears not exceeding $427 and a balloon final payment (equal to the GFV) of $10944. Additional interest charges accrue whenever a balloon final payment option is selected. Based on an annual percentage rate of 3.88 %. Terms, conditions, fees and charges apply. Offer valid until 30/04/2019. Toyota Finance reserves the right to change, extend or withdraw an offer at any time. Comparison Rate of 4.90% is based on a 5 year secured consumer fixed rate loan of $30,000.WARNING: This comparison rate is true only for the examples given and may not include all fees and charges. Different terms, fees or other loan amounts might result in a different comparison rate. Toyota Finance is a division of Toyota Finance Australia Limited ABN 48 002 435 181, AFSL and Australian Credit Licence 392536. The Guaranteed Future Value (GFV) is the minimum value of your new or approved demonstrator Toyota at the end of your finance contract, as determined by Toyota Finance, subject to fair wear and tear conditions and agreed kilometres being met. The GFV is current as at 25/04/2019. Please speak with your Dealer for more information. [†M] $106 per week is available on a Toyota Access Consumer Loan to approved personal applicants of Toyota Finance to finance the purchase of a Toyota Corolla Ascent Sport Hatch Automatic CVT with Satellite Navigation (Glacier White and Black Fabric) Automatic, 2.0L Petrol as you have selected above. Offer excludes business, government, fleet and rental buyers. Driveaway price of $28766 (includes 12 months registration, 12 months compulsory third party insurance, dealer delivery and stamp duty), less a deposit of $896 with 47 monthly payments in arrears not exceeding $456 and a balloon final payment (equal to the GFV) of $10183. Additional interest charges accrue whenever a balloon final payment option is selected. Based on an annual percentage rate of 3.88 %. Terms, conditions, fees and charges apply. Offer valid until 30/04/2019. Toyota Finance reserves the right to change, extend or withdraw an offer at any time. Comparison Rate of 4.90% is based on a 5 year secured consumer fixed rate loan of $30,000.WARNING: This comparison rate is true only for the examples given and may not include all fees and charges. Different terms, fees or other loan amounts might result in a different comparison rate. Toyota Finance is a division of Toyota Finance Australia Limited ABN 48 002 435 181, AFSL and Australian Credit Licence 392536. The Guaranteed Future Value (GFV) is the minimum value of your new or approved demonstrator Toyota at the end of your finance contract, as determined by Toyota Finance, subject to fair wear and tear conditions and agreed kilometres being met. The GFV is current as at 25/04/2019. Please speak with your Dealer for more information. 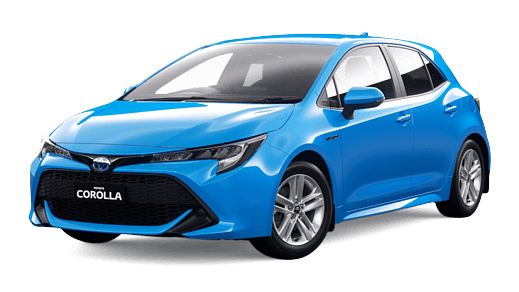 [†N] $103 per week is available on a Toyota Access Consumer Loan to approved personal applicants of Toyota Finance to finance the purchase of a Toyota Corolla Ascent Sport Hatch Automatic CVT (Eclectic Blue and Black Fabric) Automatic, 2.0L Petrol as you have selected above. Offer excludes business, government, fleet and rental buyers. Driveaway price of $28186 (includes 12 months registration, 12 months compulsory third party insurance, dealer delivery and stamp duty), less a deposit of $895 with 47 monthly payments in arrears not exceeding $442 and a balloon final payment (equal to the GFV) of $10183. Additional interest charges accrue whenever a balloon final payment option is selected. Based on an annual percentage rate of 3.88 %. Terms, conditions, fees and charges apply. Offer valid until 30/04/2019. Toyota Finance reserves the right to change, extend or withdraw an offer at any time. Comparison Rate of 4.90% is based on a 5 year secured consumer fixed rate loan of $30,000.WARNING: This comparison rate is true only for the examples given and may not include all fees and charges. Different terms, fees or other loan amounts might result in a different comparison rate. Toyota Finance is a division of Toyota Finance Australia Limited ABN 48 002 435 181, AFSL and Australian Credit Licence 392536. The Guaranteed Future Value (GFV) is the minimum value of your new or approved demonstrator Toyota at the end of your finance contract, as determined by Toyota Finance, subject to fair wear and tear conditions and agreed kilometres being met. The GFV is current as at 25/04/2019. Please speak with your Dealer for more information. [†O] $108 per week is available on a Toyota Access Consumer Loan to approved personal applicants of Toyota Finance to finance the purchase of a Toyota Corolla Ascent Sport Hatch Automatic CVT with Satellite Navigation (Crystal Pearl and Black Fabric) Automatic, 2.0L Petrol as you have selected above. Offer excludes business, government, fleet and rental buyers. Driveaway price of $29244 (includes 12 months registration, 12 months compulsory third party insurance, dealer delivery and stamp duty), less a deposit of $896 with 47 monthly payments in arrears not exceeding $467 and a balloon final payment (equal to the GFV) of $10183. Additional interest charges accrue whenever a balloon final payment option is selected. Based on an annual percentage rate of 3.88 %. Terms, conditions, fees and charges apply. Offer valid until 30/04/2019. Toyota Finance reserves the right to change, extend or withdraw an offer at any time. Comparison Rate of 4.90% is based on a 5 year secured consumer fixed rate loan of $30,000.WARNING: This comparison rate is true only for the examples given and may not include all fees and charges. Different terms, fees or other loan amounts might result in a different comparison rate. Toyota Finance is a division of Toyota Finance Australia Limited ABN 48 002 435 181, AFSL and Australian Credit Licence 392536. The Guaranteed Future Value (GFV) is the minimum value of your new or approved demonstrator Toyota at the end of your finance contract, as determined by Toyota Finance, subject to fair wear and tear conditions and agreed kilometres being met. The GFV is current as at 25/04/2019. Please speak with your Dealer for more information. [†P] $109 per week is available on a Toyota Access Consumer Loan to approved personal applicants of Toyota Finance to finance the purchase of a Toyota Corolla Ascent Sport Hatch Automatic CVT with Satellite Navigation (Eclectic Blue and Black Fabric) Automatic, 2.0L Petrol as you have selected above. Offer excludes business, government, fleet and rental buyers. Driveaway price of $29244 (includes 12 months registration, 12 months compulsory third party insurance, dealer delivery and stamp duty), less a deposit of $896 with 47 monthly payments in arrears not exceeding $472 and a balloon final payment (equal to the GFV) of $9929. Additional interest charges accrue whenever a balloon final payment option is selected. Based on an annual percentage rate of 3.88 %. Terms, conditions, fees and charges apply. Offer valid until 30/04/2019. Toyota Finance reserves the right to change, extend or withdraw an offer at any time. Comparison Rate of 4.90% is based on a 5 year secured consumer fixed rate loan of $30,000.WARNING: This comparison rate is true only for the examples given and may not include all fees and charges. Different terms, fees or other loan amounts might result in a different comparison rate. Toyota Finance is a division of Toyota Finance Australia Limited ABN 48 002 435 181, AFSL and Australian Credit Licence 392536. The Guaranteed Future Value (GFV) is the minimum value of your new or approved demonstrator Toyota at the end of your finance contract, as determined by Toyota Finance, subject to fair wear and tear conditions and agreed kilometres being met. The GFV is current as at 25/04/2019. Please speak with your Dealer for more information. [†Q] $107 per week is available on a Toyota Access Consumer Loan to approved personal applicants of Toyota Finance to finance the purchase of a Toyota Corolla Ascent Sport Hatch Automatic CVT with Satellite Navigation (Peacock Black and Black Fabric) Automatic, 2.0L Petrol as you have selected above. Offer excludes business, government, fleet and rental buyers. Driveaway price of $28994 (includes 12 months registration, 12 months compulsory third party insurance, dealer delivery and stamp duty), less a deposit of $896 with 47 monthly payments in arrears not exceeding $461 and a balloon final payment (equal to the GFV) of $10183. Additional interest charges accrue whenever a balloon final payment option is selected. Based on an annual percentage rate of 3.88 %. Terms, conditions, fees and charges apply. Offer valid until 30/04/2019. Toyota Finance reserves the right to change, extend or withdraw an offer at any time. Comparison Rate of 4.90% is based on a 5 year secured consumer fixed rate loan of $30,000.WARNING: This comparison rate is true only for the examples given and may not include all fees and charges. Different terms, fees or other loan amounts might result in a different comparison rate. Toyota Finance is a division of Toyota Finance Australia Limited ABN 48 002 435 181, AFSL and Australian Credit Licence 392536. The Guaranteed Future Value (GFV) is the minimum value of your new or approved demonstrator Toyota at the end of your finance contract, as determined by Toyota Finance, subject to fair wear and tear conditions and agreed kilometres being met. The GFV is current as at 25/04/2019. Please speak with your Dealer for more information. [†R] $107 per week is available on a Toyota Access Consumer Loan to approved personal applicants of Toyota Finance to finance the purchase of a Toyota Corolla Ascent Sport Hatch Automatic CVT with Satellite Navigation (Crystal Pearl and Black Fabric) Automatic, 2.0L Petrol as you have selected above. Offer excludes business, government, fleet and rental buyers. Driveaway price of $28994 (includes 12 months registration, 12 months compulsory third party insurance, dealer delivery and stamp duty), less a deposit of $896 with 47 monthly payments in arrears not exceeding $461 and a balloon final payment (equal to the GFV) of $10183. Additional interest charges accrue whenever a balloon final payment option is selected. Based on an annual percentage rate of 3.88 %. Terms, conditions, fees and charges apply. Offer valid until 30/04/2019. Toyota Finance reserves the right to change, extend or withdraw an offer at any time. Comparison Rate of 4.90% is based on a 5 year secured consumer fixed rate loan of $30,000.WARNING: This comparison rate is true only for the examples given and may not include all fees and charges. Different terms, fees or other loan amounts might result in a different comparison rate. Toyota Finance is a division of Toyota Finance Australia Limited ABN 48 002 435 181, AFSL and Australian Credit Licence 392536. The Guaranteed Future Value (GFV) is the minimum value of your new or approved demonstrator Toyota at the end of your finance contract, as determined by Toyota Finance, subject to fair wear and tear conditions and agreed kilometres being met. The GFV is current as at 25/04/2019. Please speak with your Dealer for more information. [†S] $107 per week is available on a Toyota Access Consumer Loan to approved personal applicants of Toyota Finance to finance the purchase of a Toyota Corolla Ascent Sport Hatch Automatic CVT with Satellite Navigation (Silver Pearl and Black Fabric) Automatic, 2.0L Petrol as you have selected above. Offer excludes business, government, fleet and rental buyers. Driveaway price of $28994 (includes 12 months registration, 12 months compulsory third party insurance, dealer delivery and stamp duty), less a deposit of $896 with 47 monthly payments in arrears not exceeding $461 and a balloon final payment (equal to the GFV) of $10183. Additional interest charges accrue whenever a balloon final payment option is selected. Based on an annual percentage rate of 3.88 %. Terms, conditions, fees and charges apply. Offer valid until 30/04/2019. Toyota Finance reserves the right to change, extend or withdraw an offer at any time. Comparison Rate of 4.90% is based on a 5 year secured consumer fixed rate loan of $30,000.WARNING: This comparison rate is true only for the examples given and may not include all fees and charges. Different terms, fees or other loan amounts might result in a different comparison rate. Toyota Finance is a division of Toyota Finance Australia Limited ABN 48 002 435 181, AFSL and Australian Credit Licence 392536. The Guaranteed Future Value (GFV) is the minimum value of your new or approved demonstrator Toyota at the end of your finance contract, as determined by Toyota Finance, subject to fair wear and tear conditions and agreed kilometres being met. The GFV is current as at 25/04/2019. Please speak with your Dealer for more information. [†T] $107 per week is available on a Toyota Access Consumer Loan to approved personal applicants of Toyota Finance to finance the purchase of a Toyota Corolla Ascent Sport Hatch Automatic CVT with Satellite Navigation (Glacier White and Black Fabric) Automatic, 2.0L Petrol as you have selected above. Offer excludes business, government, fleet and rental buyers. Driveaway price of $28994 (includes 12 months registration, 12 months compulsory third party insurance, dealer delivery and stamp duty), less a deposit of $896 with 47 monthly payments in arrears not exceeding $461 and a balloon final payment (equal to the GFV) of $10183. Additional interest charges accrue whenever a balloon final payment option is selected. Based on an annual percentage rate of 3.88 %. Terms, conditions, fees and charges apply. Offer valid until 30/04/2019. Toyota Finance reserves the right to change, extend or withdraw an offer at any time. Comparison Rate of 4.90% is based on a 5 year secured consumer fixed rate loan of $30,000.WARNING: This comparison rate is true only for the examples given and may not include all fees and charges. Different terms, fees or other loan amounts might result in a different comparison rate. Toyota Finance is a division of Toyota Finance Australia Limited ABN 48 002 435 181, AFSL and Australian Credit Licence 392536. The Guaranteed Future Value (GFV) is the minimum value of your new or approved demonstrator Toyota at the end of your finance contract, as determined by Toyota Finance, subject to fair wear and tear conditions and agreed kilometres being met. The GFV is current as at 25/04/2019. Please speak with your Dealer for more information. [†U] $96 per week is available on a Toyota Access Consumer Loan to approved personal applicants of Toyota Finance to finance the purchase of a Toyota Corolla Ascent Sport Hatch Automatic CVT (Volcanic Red and Black Fabric) Automatic, 2.0L Petrol as you have selected above. Offer excludes business, government, fleet and rental buyers. Driveaway price of $26990 (includes 12 months registration, 12 months compulsory third party insurance, dealer delivery and stamp duty), less a deposit of $895 with 47 monthly payments in arrears not exceeding $415 and a balloon final payment (equal to the GFV) of $10183. Additional interest charges accrue whenever a balloon final payment option is selected. Based on an annual percentage rate of 3.88 %. Terms, conditions, fees and charges apply. Offer valid until 30/04/2019. Toyota Finance reserves the right to change, extend or withdraw an offer at any time. Comparison Rate of 4.90% is based on a 5 year secured consumer fixed rate loan of $30,000.WARNING: This comparison rate is true only for the examples given and may not include all fees and charges. Different terms, fees or other loan amounts might result in a different comparison rate. Toyota Finance is a division of Toyota Finance Australia Limited ABN 48 002 435 181, AFSL and Australian Credit Licence 392536. The Guaranteed Future Value (GFV) is the minimum value of your new or approved demonstrator Toyota at the end of your finance contract, as determined by Toyota Finance, subject to fair wear and tear conditions and agreed kilometres being met. The GFV is current as at 25/04/2019. Please speak with your Dealer for more information. [†V] $102 per week is available on a Toyota Access Consumer Loan to approved personal applicants of Toyota Finance to finance the purchase of a Toyota Corolla Ascent Sport Hatch Automatic CVT (Silver Pearl and Black Fabric) Automatic, 2.0L Petrol as you have selected above. Offer excludes business, government, fleet and rental buyers. Driveaway price of $27994 (includes 12 months registration, 12 months compulsory third party insurance, dealer delivery and stamp duty), less a deposit of $895 with 47 monthly payments in arrears not exceeding $438 and a balloon final payment (equal to the GFV) of $10183. Additional interest charges accrue whenever a balloon final payment option is selected. Based on an annual percentage rate of 3.88 %. Terms, conditions, fees and charges apply. Offer valid until 30/04/2019. Toyota Finance reserves the right to change, extend or withdraw an offer at any time. Comparison Rate of 4.90% is based on a 5 year secured consumer fixed rate loan of $30,000.WARNING: This comparison rate is true only for the examples given and may not include all fees and charges. Different terms, fees or other loan amounts might result in a different comparison rate. Toyota Finance is a division of Toyota Finance Australia Limited ABN 48 002 435 181, AFSL and Australian Credit Licence 392536. The Guaranteed Future Value (GFV) is the minimum value of your new or approved demonstrator Toyota at the end of your finance contract, as determined by Toyota Finance, subject to fair wear and tear conditions and agreed kilometres being met. The GFV is current as at 25/04/2019. Please speak with your Dealer for more information.